China blocked a much-anticipated United Nations resolution to curb lead in paint during last-ditch negotiations at the U.N. Environment Assembly (UNEA) in Nairobi. China was the only country on Friday to reject a proposed section to “encourage” governments to adopt anti-lead paint laws. As a result, a broad U.N. resolution to limit chemicals and waste worldwide contained no reference to lead paint. “Due to the action of a single country with a lead paint problem who objected, [the U.N. Environment Assembly] was unable to even ‘encourage’ actions to eliminate lead paint – a product that causes permanent brain damage and costs nearly $1 trillion each year,” said Joseph DiGangi, science and technical adviser for IPEN, a global anti-toxics nonprofit present at the assembly. Lead exposure can lead to permanent brain damage in young children if paint chips are eaten or paint dust is inhaled. Decreased IQ (intelligence quotient) in children due to lead poisoning represents a $977 billion economic loss in developing countries, according to a report from New York University’s medical school released during the UNEA. In China, 16 million children under the age of 5 are exposed to lead poisoning with an estimated economic cost of $227 billion each year. In the majority of developing countries, there are no laws regulating the amount of lead in paint, according to a study from the United Nations Environment Program (UNEP). The United States limits lead in paint to no more than 90 parts per million. But tests in the developing world found lead levels of 10,000 to 100,000 parts per million in decorative paint used in homes, schools, hospitals and other buildings. Lead exposure leads to lower IQ and decreases in lifetime earning potential. Researchers estimated the correlated economic loss in Africa is $134.7 billion, or 4.03 percent of gross domestic product (GDP) in the region; $699.9 billion in Asia, or 1.88 percent of GDP; and $142.3 billion in Latin America and the Caribbean, or 2.04 percent of GDP. Excluding lead in paint from the U.N. resolution is a disappointing blow for policymakers. However, many developing countries are already drafting new regulations on lead paint as part of the Global Alliance to End Lead Paint by 2020. The alliance, launched in 2009, is a voluntary partnership of governments, nongovernmental organizations and agencies such as UNEP, the World Health Organization and the U.S. Environmental Protection Agency. With support from the alliance, Sri Lanka, Philippines, Nepal and Thailand have enacted new laws limiting lead in paint. India and Bangladesh are finalizing draft regulations. Fifteen African countries, including Kenya and Ethiopia, are already forming new regulations expected to be finalized this year. “Unless we do something now, then we are exposing our children to serious danger,” said Allan Meso of UNEP’s environmental law division in Nairobi. Meso attended a meeting of African partners in Addis Ababa, Ethiopia, in December. Lack of awareness about the health threats of lead paint is a major hurdle. Lack of expertise in testing as well as regulating informal paint makers are also challenges. But substituting lead in paint with safe alternatives is relatively simple and inexpensive. 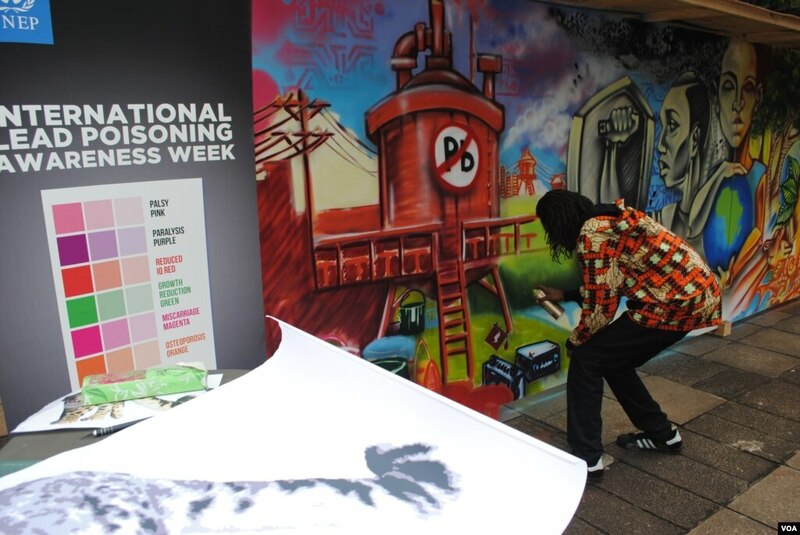 Paint company Basco voluntarily phased out lead in paint in 2013 and became the first lead-free paint maker in East Africa. The company did not need to retrofit equipment, and did not increase the retail price of its lead-free paint, instead absorbing the extra 10 to 12 percent in costs to make it, said Santosh Pawar who works in research and development for Basco in Kenya.